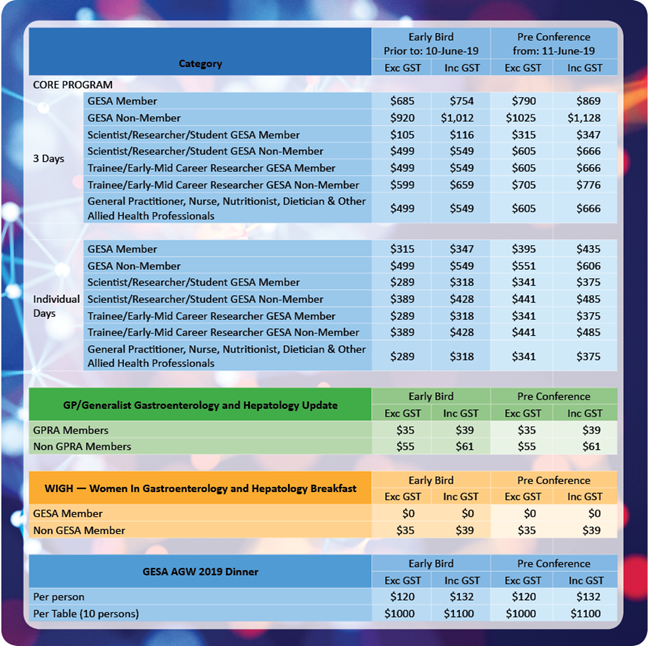 The annual scientific meeting of GESA is Australian Gastroenterology Week (AGW) - held during Spring in a capital city of Australia. AGW is one of the significant scientific meetings in the Asia-Pacific region and features the latest advances in clinical management, cutting-edge translational and basic science, and original research in endoscopy, gastroenterology and hepatology. Since the inaugural meeting, AGW has grown in attendance from 25 to over 2,000 medical practitioners, surgeons, researchers, and allied health professionals from across the Asia Pacific region.The three-day program features several synergistic themes designed to encourage interaction between various interest groups in concurrent scientific and educational sessions includng 'state of the art' lectures, symposia, free papers, 'early-bird' sessions and poster presentations.